The Mike Risko Music School has been providing the community with a great place to study music since 1995. All lessons are given at our state of the art school located at 144 Croton Avenue in Ossining, where we have eight spacious lesson rooms, a comfortable waiting rooms and 2 small stages for performances. Fully equipped, sound proofed studios provide the ultimate environment for a music lesson. 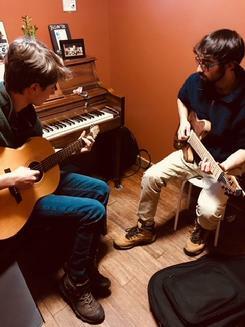 Private lessons are offered on the following instruments: Guitar, bass, drums, piano, voice, violin, viola, cello, flute, saxophone, clarinet, trumpet, & trombone. 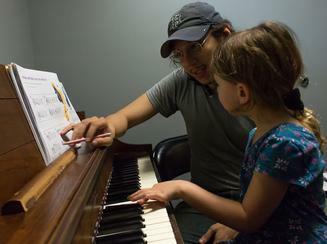 Students of all ages and levels may begin taking lessons at any time during the school year. Lessons are either 30, 45 or 60 minutes long. Students register by the session. There are two semesters during the school year and a summer session. All new students are invited to come in for a free consultation. Lessons are offered Monday through Thursday from 1-9, Friday from 2-5:30 and Saturday from 9:30-5. Weekday morning lessons are available by request. With over 30 teachers to choose from and a great curriculum, students are will really enjoy studying music at the Mike Risko Music School. For more information or to set up a free consultation, please contact us. You can also read more about our private lessons by going to Lessons for Kids, Lessons for Adults or Lessons for Pre-K. To register for lessons, please go to Register or call us at 914-762-8757. Our lesson rooms are designed to inspire creativity. All eight rooms are painted in muted earth tones with big glass windows on every door and windows allowing in fressh air and sunlight. All rooms are equipped with a real piano. amps, cables, music stands and extra chairs for parents who are interested in sitting in the lesson. Our drum room has 2 drum sets, one for the teacher and one for the student. We also have a live Video Lesson Studio for students who would like to sign in and take lessons from their home or for in house students who may be studying with our additional staff located in other parts of the country.